Healthcare is getting safer, smarter and more secure with HP’s new lineup of Windows 10 devices | Com-Tech of Miami, Inc. Healthcare is getting safer, smarter and more secure with HP’s new lineup of Windows 10 devices - Com-Tech of Miami, Inc. The HP Healthcare Edition portfolio is safer to use in patient rooms by being built with special coatings and specific materials designed to resist deterioration from harsh germicidal wipes, making them easy to clean and disinfect after every shift, every day. The portfolio is also tested to meet stringent EN/IEC 60601-1-2:2015 standards which define electrical safety conditions for medical equipment. Meeting these standards mean the devices are not oversensitive to radio frequency interference, nor will it produce electromagnetic emissions that interfere with other medical equipment and systems. These devices also deliver an optimal, collaborative telemedicine experience with Vidyo Ready and Skype for Business capabilities for superior video calls and conferencing, as well as built-in BIOS-level protection and robust, optional multi-factor authentication features to provide maximum device and data protection to comply more easily with HIPAA requirements. Powered by Windows 10, the notebook and AiO also ship with features including RGB/IR cameras and FIPS 201-compliant fingerprint readers that light up Windows Hello for fast and secure login, comprehensive protection with Windows Defender and more. The HP EliteBook 840 G5 Healthcare Edition Notebook is an ultra-slim notebook for healthcare that features integrated dual-band RFID and biometrics for single sign-on authentication with Windows Hello. Clinicians can save time electronically prescribing controlled substances with the optional FIPS-201 compliant fingerprint reader, or logging in with the IR camera and Windows Hello. The notebook comes with HP Easy Clean: a quick and easy sanitization application that disables computer input devices such as the keyboard, the touchscreen and the touchpad for a set amount of time, making it is easy to clean. The notebook also features an integrated privacy screen and is optimized for an intuitive collaboration experience with audio boost and noise cancellation features, as well as an IR/RGB camera for optimized audio and video calls. Availability: HP EliteBook 840 G5 Healthcare Edition Notebook is expected to be available in May. The HP EliteOne 800 G4 23.8 Healthcare Edition AiO has an integrated dual-band RFID and biometrics for single sign-on authentication so clinicians can save time logging in using Windows Hello with the optional FIPS-201 compliant fingerprint reader or the optional IR camera. This AiO also features HP Manageability Integration Kit which makes it easy to implement HP’s security features across clinical organizations, and provides audio boost and noise cancellation features to minimize background distractions from noisy environments, as well as a dual-facing pop-camera to simplify patient registration and badging. 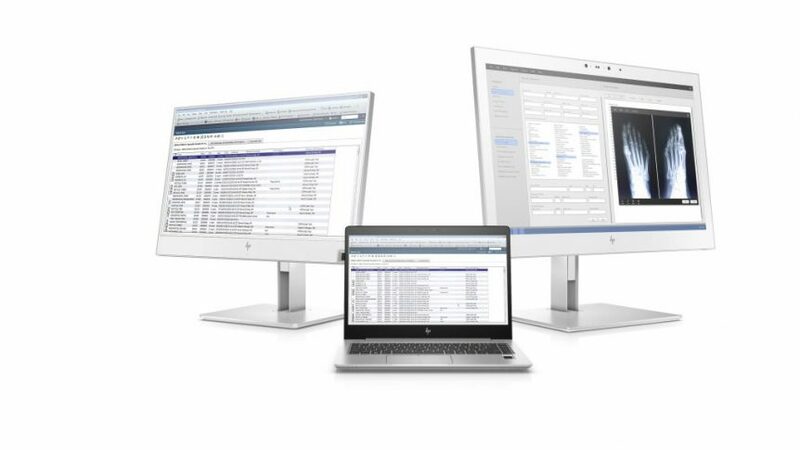 Availability: HP EliteOne 800 G4 23.8 Healthcare Edition All-in-One is expected to be available in June. The HP Healthcare Edition HC270cr Clinical Review Display has an integrated RGB webcam and IR sensor so clinicians can login easily with Windows Hello. This 27-inch diagonal, 3.7-megapixel clinical review display is DICOM Part 14-compliant with features for more accurately viewing medical images, such as automatic backlight monitoring and auto image rotation. It also arrives with USB-C that supplies up to 65w power delivery for connected devices. Availability: HP Healthcare Edition HC270cr Clinical Review Display is expected to be available in June. To learn more, please visit hp.com. The post Healthcare is getting safer, smarter and more secure with HP’s new lineup of Windows 10 devices appeared first on Windows For Your Business.